In this post we will create the outskirts of the city, farmlands and the ruins. First of all you have to decide what parts of the city that will be farmland and what part will be ruins. In this map I wanted to create the feeling that the city is situated in the middle of an old ruined city. The two closest islands to the east and west of the city will consist of farmland. Those areas are close to the city and will be easy to protect as well. On the north part of the western island you can also see that a part of the old city wall has been taken into use again, to protect the city from whatever hides outside. When I create farmland I always start by putting in all the roads and houses. Usually you will have a cluster of houses just outside the city gates, the further away you get from the gates the more space you will have between houses. I then select the city hedge drawing tools and start to mark out the area where the fields will be. I’m actually using the same technique here as I do when I’m making smaller towns. For a more thorough explanation on how I draw the fields see my Mapping a small town part 4 post from January this year. 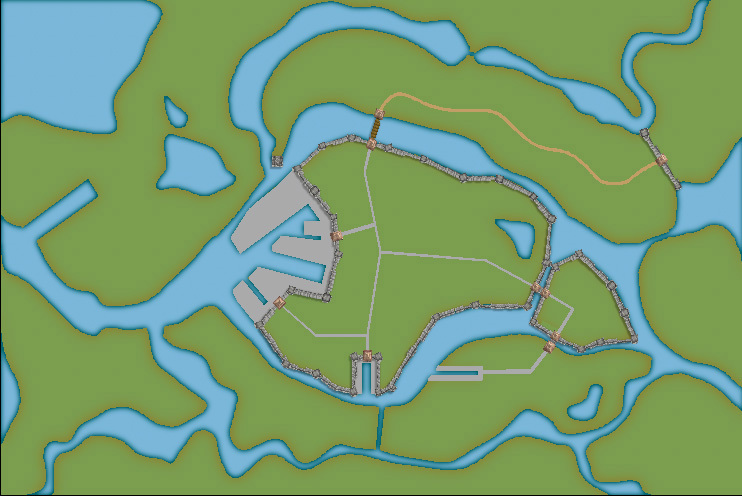 When I’m done with all the fields the map looks like the picture below, so still some ruins to put in. To complete the fields in the map I also export a map from CD3 where all the land is yellow. In this way I can combine them in Photoshop and paint in some yellow fields among the green ones. This will give you a more natural look than if the fields are just green. See my Mapping a small town part 6 post for more info on how to do this. The yellow version of the map looks like the picture below. You can of course add in all the yellow fields in CD3, but I’ve found that to be a lot more time consuming then doing it by combining the two pictures above in a third party program. This program doesn’t need to be Photoshop, use the program that you feel comfortable with. The next step would be to add in some ruins in the picture. Here I must say that CD3 doesn’t really have any good styles to work with, so I had to make something up myself. Creating a completely new style wasn’t something I felt I had the time or knowledge to do, but I think a good ruined city style would be a great future annual style add on (are you listening Profantasy?). Sure you have some ruins in the program that you can use, but for me a ruined city mainly consists of the foundations of the houses and maybe some larger, more intact, buildings. So I decided to draw in some random roads and houses using the CD3 B Ruins Grey buildings. They’re not perfect, but they are a good base symbol to continue working from. 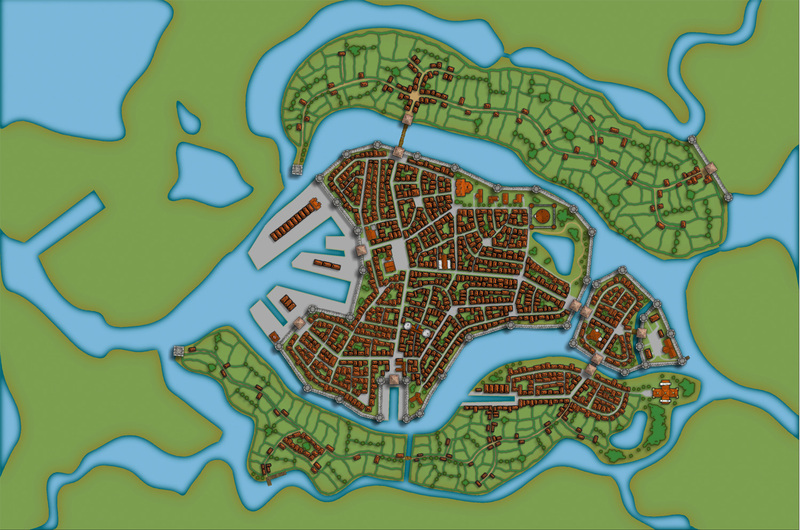 When I’ve put in all the roads and larger buildings in the map I’d export it again from CD3. This means that I now have three different versions of the map, which I’m going to put together in Photoshop, the two different ones with yellow and green fields and this one with a green background and ruins in the outskirts of the city. At this stage I had to work on the ruins a bit in Photoshop to make them look more like ruins. If you put the map with ruins in one layer and put it on top of a layer consisting of the map with green fields. You can start to erase bits and pieces from the top layer, when you do this the layer below will be visible instead of the top one. In this way I erased all the inner parts of the buildings, which left something that looked more like the foundation of a house. I also erased parts of the larger buildings to make them look more like ruins with broken roofs and missing walls. In the picture above you can see a part of the map where you have the ruins as they look in CD3 on the left side, and how they turned out after some editing in Photoshop on the right side. In my opinion the right side looks more like ruins then the left side. Or at least more like the ruins I wanted in this particular map. One of the best strengths when it comes to Profantasy’s product line is that the products are easy to use and good at producing great maps in a fairly short time. I’ve decided to introduce my two oldest kids in the world of roleplaying, and if you’re going to play with someone for their first time you need to make an impression on them. So you need maps! We talked a lot about how you play and that you don’t have any gaming board that you use. I said that it was a bit like playing a fairytale. They both thought it sounded great. The system we used is called Äventyr, a roleplaying game for children made by a Swedish guy and his eight year old daughter. It is very simple but works really good as an introduction. In one of the first adventures I played with them they had to enter a mine and get rid of the dangerous Trolls that had moved in. 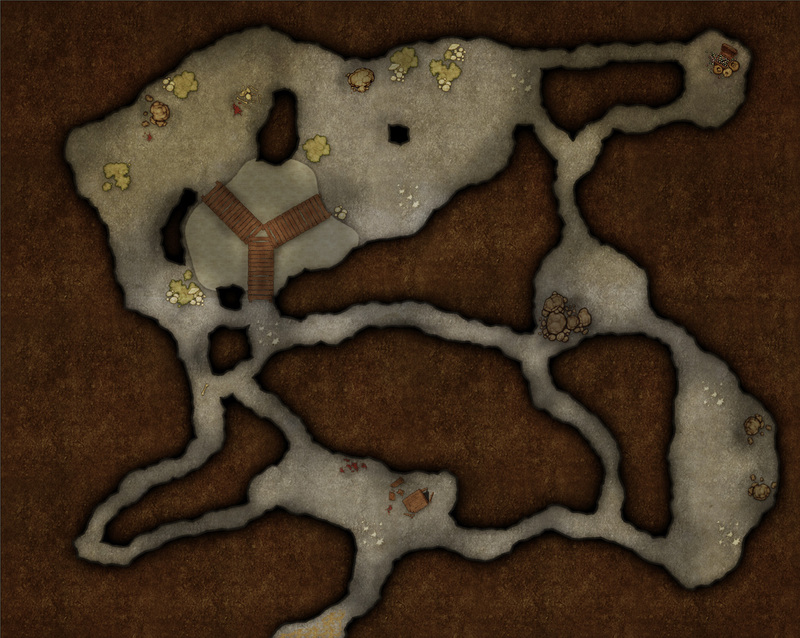 To make it more exciting I made a quick map in Dungeon designer 3 of the mine. This map took me about an hour from start to finish. Nothing fancy or complicated, but it is great that you in such a short time can make something that actually looks good and pleasing to the eyes. We now have the basic layout of the city. Next step is to put in more roads and try to decide where the majority of buildings will be placed. 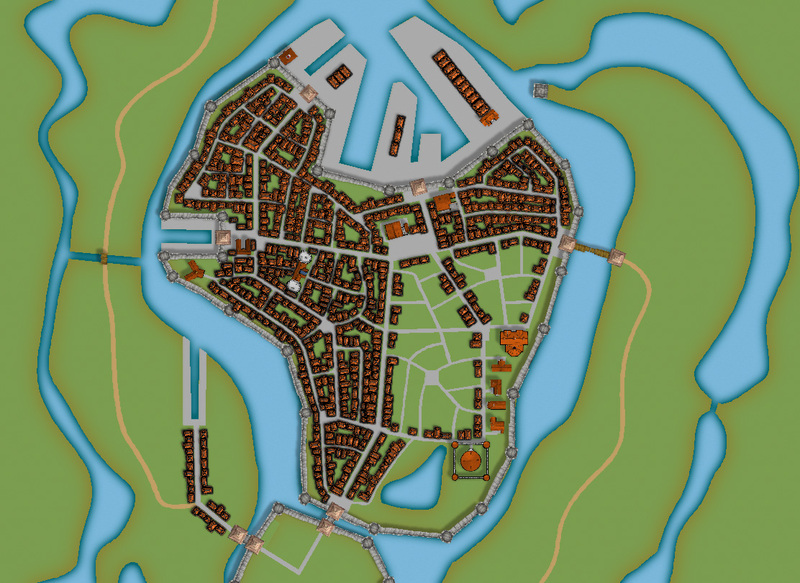 Sometimes when you create a large city the process of placing all the houses can be overwhelming. To make this easier I try to divide the city into smaller areas. I then place the houses one area at the time, in this way you divide the work into smaller goals that you can reach quite quick. It will make the whole process much easier. In the picture below you can see how I’ve divided the city of lost souls into seven areas to fill in with houses. A good idea can also be to try to make every area intresting by adding a major house, villa or temple in it. It will add some details to your city and will make the end product more fun to look at. At this stage I also try to locate where the major squares will be, naturally they will be situated where the large roads meet up. I also like to add some smaller squares in front of the gates, usually this is where people have to wait to get in and out of the city. You also have to decide what density your city will have. Nearly all cities have some sort of park or green area, older cities could actually have quite a lot of farmland inside the walls. In this case how ever the farmlands are outside the city walls. When I start to place the houses I zoom in and out to quite a lot to check the progress of the area I’m doing to make sure that the network of roads and houses looks natural. A good thing to think about is if the area you’re making is planned or if it has grown over time. To understand the difference in how a planned city looks compared to one that has grown over time you can look at some modern cities in USA (for example New York) and compare it to some older ones in Europe (for example Venice). The planned ones tend to have straight roads in squares and the grown ones usually have roads and city blocks in all kind of versions. At first you can’t really see any logic in the city construction, but after a while you will start to see that roads lead between squares and larger empty areas usually consist of an important building and its surroundings. When I start to map an area I always start with the roads. First I add in some larger main roads, I then switch to a smaller road to make intersections between the larger roads. In the picture below you can see a nearly finished inner part of the city. I’m working on the last area and have put in the roads and squares. The squares I try to place in areas that feel natural. Also try to have some space between squares, a square is a place to meet and trade, so they will be evenly spread out in the city. When I add houses to a city or town I always start by using the Random street tool. The ability to quickly add all houses on a street is one of City Designer 3’s best advantages. When you’ve added a lot of streets it isn’t always possible to use the Random street tool everywhere, in those cases I add the houses one by one. Sometimes you also have to go back after adding houses with the Random street tool and delete houses that don’t fit in for one reason or another. When I use the Ramdom street tool I try to make the houses come as close to each other as possible. To do that you have to change the settings a bit. Right click on the Random street tool icon and in the street option window you click the Street settings button. The settings I used for the map you can see in the picture below. The most important setting is the Distance between houses that I always set to 1, both as Min and Max value. In this way you will get the houses as close as possible togehther. The other values depend on the scale of the map that you’re doing. You have to try some different settings here and see what works out. When you’ve added houses to all your areas in the town you are done with the central parts of your city. Don’t forget to zoom out once in a while and check that the streets look good. I often have to go back and add some more roads to make the city more crowded. In the next post we will start on the outskirts of the city, farmlands and ruins. Ok so far we have the landscape where the city will be situated. 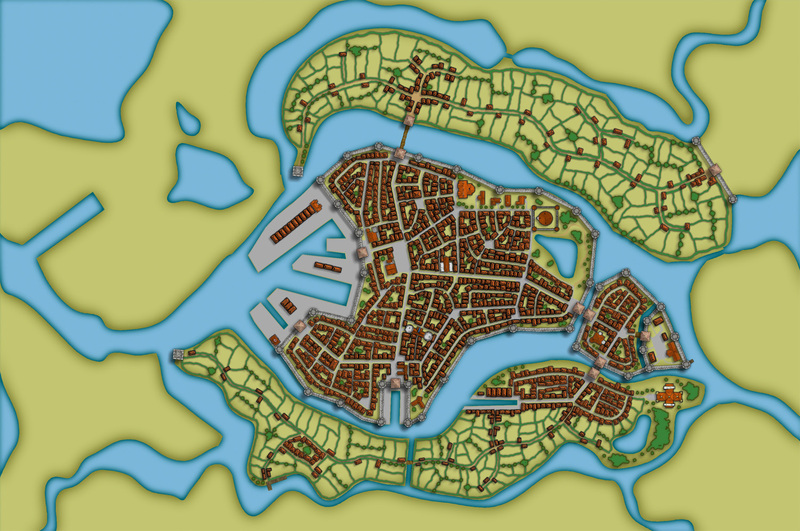 When creating the City of the Lost I combined graphics from three different styles in City designer 3. First of all the actual landscape, which is what we have at the moment, is made in City style A, later on when I add in houses I mainly use the graphics from City style B. The reason for this is that those houses looks more painted then the one in style A that looks more 3d generated. Which one to prefer is up to you, but in the maps I do the style B graphics are better suited. 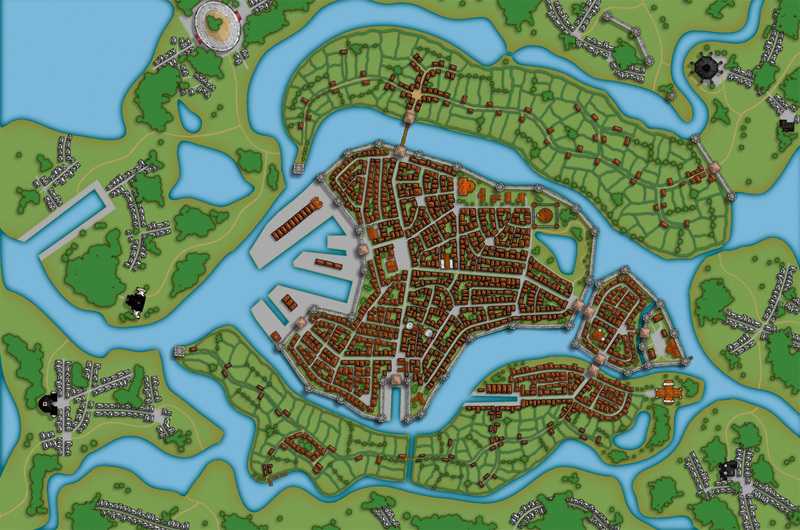 In this map I’m also using some graphics from the Profantasy March annual, Jon Roberts city style. In that style I’m especially fond of the city walls and towers. However the walls in this style are a bit harder to place due to being built from a static graphic file. So you have to watch the corners because they tend to create some gaps there. A good way to hide this is to place a tower on the “bad” spot. When I start a new town I usually always start by building the town wall and deciding where the gates will be. In this way you will get a clear view and idea on where the majority of houses will be placed, so you can plan ahead and get a good balance in the map. In this particular map we also have three different docks, one larger and two smaller ones. In older cities the docks where often situated outside the city walls. In this way you could both tax the goods efficiently when they were entering the actual city and you also didn’t need to compromise the security of the town. 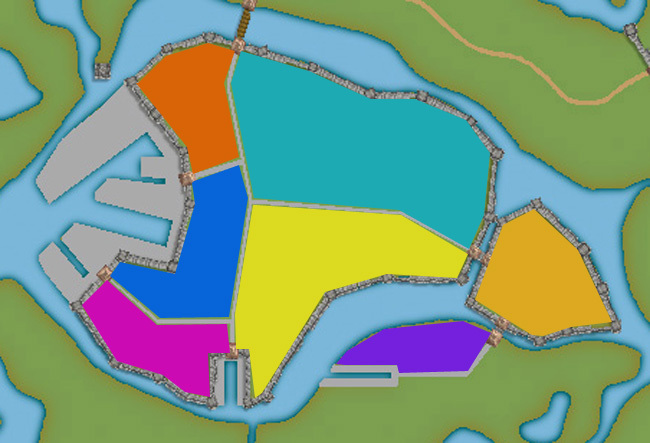 So I’m placing the two docks on the central island outside the walls. The small third dock however is situated in an area where you have no walls. This dock is probably used for more local trading, not taking in ships from abroad. The idea with the docks is also that they are remnants from an earlier city that has been reused. So naturally it is around the docks that the “new” city is built. Now when we have the walls and gates of the city I put in the main roads. The logic here is that all main roads in a city usually will take you from gate A to gate B. Somewhere in between you will have some main areas like a square or a city hall etc. In this way you will also create some natural boundaries for different districts in your city. It will make it easier for you to plan the next step, adding more roads and start adding houses.